For comparison take a look at the situation few years back. Last year (2013) total value of the Finnish games industry (game development and services, corporate acquisition, tie-in merchandise, licence sales and investments) was estimated to be two billion Euros and turnover was 800 million Euros. The Game Industry of Finland report from Tekes says that in Q4 / 2012 Finnish game industry consists of approximately 150 companies. Significant part of the companies develop mobile games. The start-up scene is vibrant: 40% of the existing game companies have been established 2011–2012. The Game Industry of Finland report presents some facts and figures about one of the most dynamic game development countries at the moment. Supercell was built from zero to $3 Billion in just 3 Years. 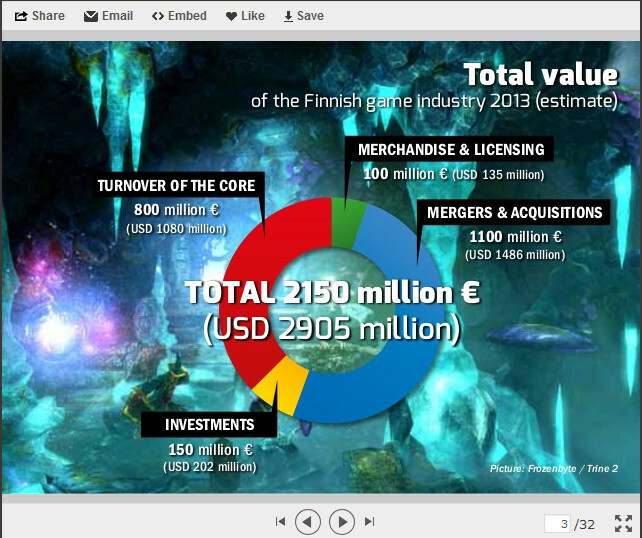 Finnish game industry’s turnover last year was a total of EUR 2.4 billion, estimates the industry association NeoGames. Growth from the previous year’s 33 per cent. On the other hand supercel the sheer size of obscure statistics. Its turnover last year was € 2.1 billion. The rest of the game industry’s share was thus only around EUR 300 million – and the fact Rovio account for about half. At the end of 2015, Finnish gaming industry was approximately 290 companies. A significant phenomenon is so to speak a second or third round of the serial entrepreneurs, start-ups, which is already a third of new game companies. This can be regarded as evidence of the maturation of the industry. Experienced entrepreneurs have also newcomers a better chance of success. When new companies have emerged in recent years to hard pace, a large part of the Finnish game companies have less than five years old. More than a decade old game companies is 20. About 40 percent of companies in the sector is located in the metropolitan area. 95 percent of the sector’s turnover comes from exports, which makes it a significant export sector. A significant part of both the global and Finnish game industry’s growth in 2015 came from the Asian market. In 2015, Finland, slightly more than 150 games published. A large part of the games are mobile games. Despite the strong mobile presence Finland is a significant development of the game to other platforms. Especially PCs Steam distribution platform achieved the popularity of last year and during the 2015 developers was released about 30 PC or console game. Rovio collapsed on the stock market, the smaller gaming companies hold their mark: Do you already know these firms? At the beginning of this year there were no Finnish gaming companies in the public quotation. Now there are four, write Talouselämä . Prior to Rovio’s entry into the main list of the Helsinki Stock Exchange, First North was foreseen by Next Games, Remedy Entertainment and Nitro Games. Next Games and Remedy took place on the Helsinki, Nitro Stockholm Stock Exchange.